Benson & Hedges Longer Than King Size Ad 1968 This is a June 14, 1968 advertisement. It is a nice color ad from Benson & Hedges cigarettes. This is a nice color pictures, done mostly in various shades of brown. Pictures an Indian sitting on the ground. Pony is standing behind him. He is smoking a Benson & Hedges and sending up smoke signals with puffs on his cigarette and it reads, 3,4 maybe 5 words longer than King size. In mint condition. Photo is taken through plastic and may show wrinkles or crookedness that is not in the ad. This magazine tear sheet measures 10 1/4"" wide by 13 3/4"" tall. 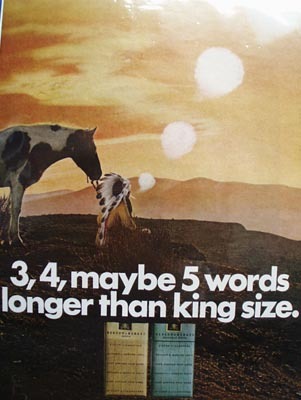 Items Similar To "Benson & Hedges Longer Than King Size Ad 1968"